Just so we all know: our doctors are direct-marketed by drug companies. A new study, which paints a picture of just one small geographic area, brings up some interesting questions. Unsavory questions, if you will. In 2011, drug companies spent about $84 million advertising drugs just in D.C. Included in that is about $19 million for gifts straight to doctors, hospitals and healthcare providers. The study shows that 12 doctors in the area received gifts totaling over $100,000 each, in 2011. Though not illegal, it does strike you as kind of funny, doesn’t it? For instance, when a doctor reaches for a prescription pad, is he more likely to write the name of a drug by a company who has given him a gift? It’s only logical to question that in some way. Previous studies by this same group of researchers found that companies making antipsychotic drugs were giving far more gifts and payments to the region’s psychiatrists treating Medicaid patients. This has led to hearings on the intimate ties between drug companies and psychiatrists in regard to Medicaid recipients. But what if it may have been better not to prescribe a drug at all? Or at least to consider all available options before reaching for a pen to write a prescription? That’s what drug marketing does: it can stimulate that impulse of a doctor to write off the problem with a medication. Spending $84 million just on drug advertising is not even unusual. In fact, 23 out of the 158 companies were spending more than $1 million each—just to advertise drugs, in one year! The study went on to find that marketing departments used 22% of their budgets to purchase gifts for doctors. These are things like dinners out, grants, and speaker’s fees. This story kind of speaks for itself. What impression do you get from facts like the following? • 82% of gifts by drug companies went to doctors, the ones who sign prescriptions. • Of the 3,400 doctors in the region with at least one food gift, 444 received 10 or more and 33 of them got at least 52 gifts! Read between the lines: some doctors are enjoying meals with drug reps nearly every week. • The biggest 10 professional organizations got $3.5 million. • Organizations set up to fight specific diseases got $2.1 million in gifts. 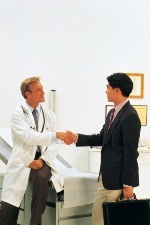 They are the ones representing and advising patients on treatment paths. This stuff isn’t a state secret, but doesn’t it make you want to give alternative medicine more of a chance? It begs the question: what is influencing your doctor? “Pharmaceutical companies: An $84 million marketing effort in the District of Columbia,” George Washington University, March 1, 2013.